The Yellow Labrador retriever is one of the most popular breeds of dog in the world. The yellow is the 2nd most popular Labrador color after black. Labs are known for being loyal, friendly, and good-natured, making them good companions for people of all ages, and an ideal family dog. These dogs are very patient, which makes them good with children, as well. They are big, friendly and full of life. The breed does well in cold environments and make an excellent family dog and are a very low risk for biting people. Because they are smart they are easy to train and love to please. Training should start as a puppy. The Lab has great stamina and loves to swim and is anatomically made for the task with strong haunches (back legs), webbed paws and a tail designed to help them steer through the water. Labs were originally bred to fetch fish that fell off of fisherman's hooks in Newfoundland. The web paws make them powerful swimmers as well as their tail that resembles that of an otter. They have a slightly oily coat that helps them stay dry and get dry fast. Labradors also have what is called a soft mouth, which means that they can grip a delicate object like an egg and not break it (if trained). Yellow Labs are one of the most common breeds used in police work, as well as companion or assistant dogs for the disabled. They respond well to training, making them good working dogs. Though they can be a little unruly if they aren't trained, a Lab will respond well to positive attention and praise, and with training, are one of the most dependable, obedient, and multi-talented breeds in the world. Within the Lab breed there are different types of dogs, most often identified by the different coloured lab pigment. The Lab is one of the most popular breeds of dog in the world and those that are called yellow range in shade from light yellow to a more golden yellow that looks almost tan. The other common types of Lab are black and chocolate. 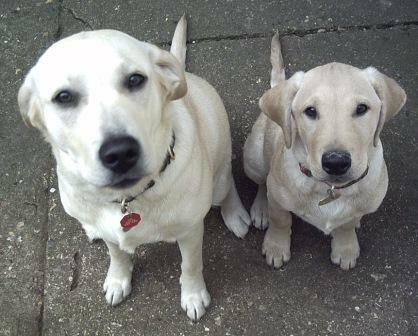 There are two distinct kinds of yellow Labrador retriever. The first is yellow with black pigment. With these types, the lab pigment is yellow, and the black can be seen on the muzzle and around the eyes. The second kind are those with black noses, though there is variation within this group of Labs. Some dogs have just a little black pigment around their muzzle and eyes, while on others it's more noticeable. With some, the lab pigment in their noses begins to fade as puppies, but others keep dark black noses until they're older. In others the lab pigment is yellow with "liver" pigment on the muzzle and around the eyes. This pigment appears brown on the muzzle, around the eyes, and they have brown noses, as well. 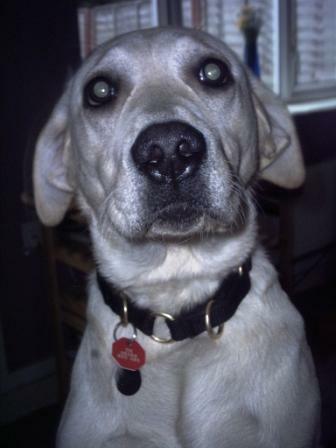 A more rare type of yellow Labrador retriever is called a Dudley. These dogs have no pigment, so their eye rims, nose, and feet are pink, and remain so throughout their lives. Some Labs with liver lab pigment are also referred to as a Dudley, but according to the American Kennel Club, they are not, no matter how light the liver pigment is. With most yellow Labrador retrievers, their noses fade from black or brown to pink. This is due to the breakdown of an enzyme, called tyrosinase, which produces pigment. As the dog ages, the nose fades to what's sometimes called the "winter" or "snow" nose. The production of pigment in the dog's nose is also dependent on temperature. Tyrosinase works better in warmer weather, so during warmer months the nose may fade back to black or purple. The yellow Labrador retriever is a unique dog. Even this type of Labrador retriever has variations, but they still have all the traits that make them a great dog for lots of people. This type of dog is one of the those people picture when they call to mind a house in the country with a white picket fence, kids, and a dog playing in the yard. When considering a yellow labrador retriever puppy know that they are one of the "mouthiest" dogs meaning they like to get their razor sharp teeth on everything. The good news is that they are also one of the smartest and easiest to train dogs, and with even a little direction will quickly learn how to behave. Labs are also energetic dogs, and require room to run and sprint. They can reach speeds as fast as 12 mph in seconds. 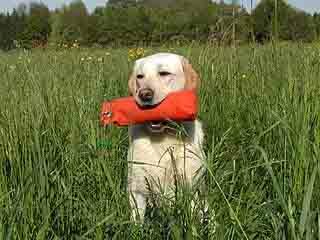 In general the Labrador Retriever is a healthy dog with a life expectancy of 12 to 13 years. The Labrador breed is known for genetic issues such as hip dysplasia and retinal dysplasia. Since they are athletic dogs, they can also have problems in the knees/joints and elbows. Because these can be costly problems, it's a good idea to look into Pet Health Insurance. Labradors require minimal grooming. They do shed moderately in the spring and fall. For a Labrador to be born yellow, both parents need to have a recessive yellow gene (yy). If each parent passes on the yellow gene to the puppy, the black or brown gene becomes inactive. If only one parent contributes a yellow gene, the the labrador puppy will be either chocolate or black. 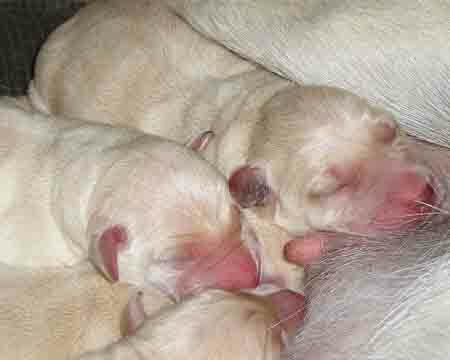 If both parents are yellow labrador retrievers, then the puppies will be yellow. Black or chocolate parents can have yellow puppies if both have a recessive yellow gene, making for interesting family.